As if things weren't grim enough for the characters in Art Asylum and Diamond Select Toys' The Walking Dead comic series Minimates line, the fourth wave will introduce all kinds of intensity from Robert Kirkman, Tony Moore and Charlie Adlard's zombie drama. After all, it's not just zombies the survivors have to fear, but well-armed sinister humans. As usual, the line will be split into four different roughly $15 two-packs, this time pairing The Governor with Gabe, a poncho-wearing Michonne with Bruce, Prison Lori (and... baby) with Shoulder Zombie, and Alice with Shoulder Zombie. The Prison Lori and Alice packs will only be available in specialty stores like comic shops and online retailers, though, so don't sweat it if you don't see them at Toys "R" Us or elsewhere come August. 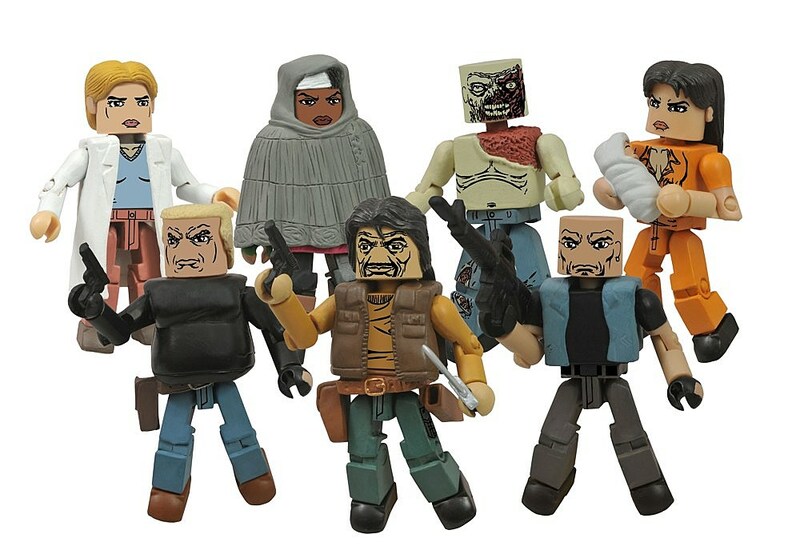 You can take a closer look at the fourth wave of The Walking Dead comic series Minimates after the jump.